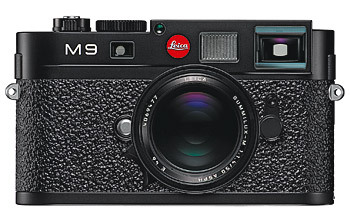 Leica M9 - ultimate dream camera? I'm in love. 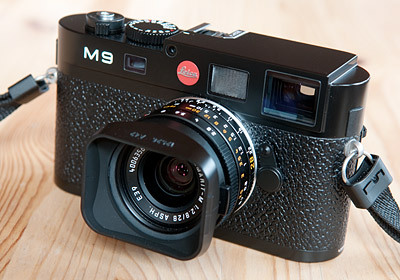 The 18 megapixel Leica M9 is simply the cutest little camera you can imagine. Shortly after its announcement in September 2009, I was lucky to spend a few days with one of the first production cameras to get out of the Leica factory in Solms. 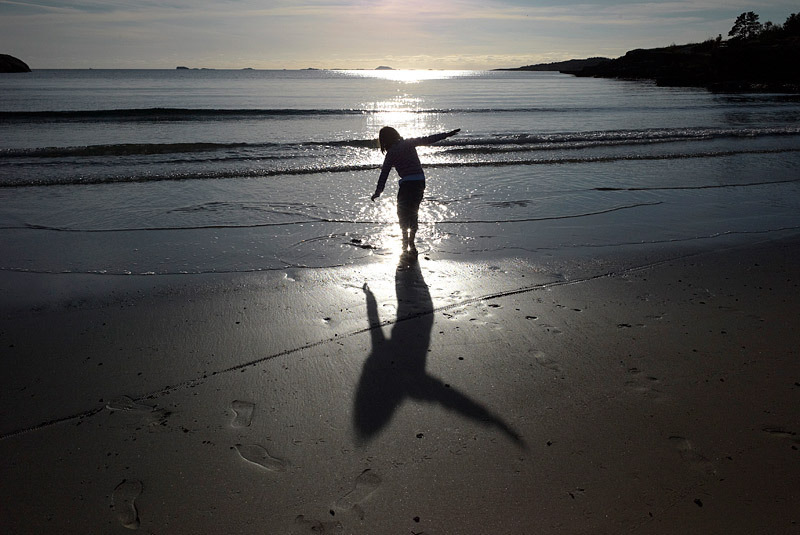 Title photo is taken with a Leica Elmarit-M 28mm f/2.8 lens mounted on a Leica M9. 1/250 sec. 160 ISO. You probably know all the technical specifications already, so I won't bore you with information that can be easily found elsewhere. Instead, I'll offer my own first impressions and thoughts about the M9. Personally, I'm more interested in photography than pixels, so I'll leave the pixel peeping and analysis to others. There will undoubtedly be enough pixels to look at as more people get their cameras and start to flood the web forums with cropped M9 photos (I've done it too, by the way, so I'm not completely innocent). Just for the record, I'm an experienced photographer - but I've never used a Leica rangefinder before. However, I own two Nikon rangefinders, a 1955 Nikon S2 and a 1957 Nikon SP (by many regarded superior even to the contemporary and highly regarded Leica M3). In other words, I'm familiar with the unique handling characteristics of a classic 35mm rangefinder, compared to SLRs and other cameras. 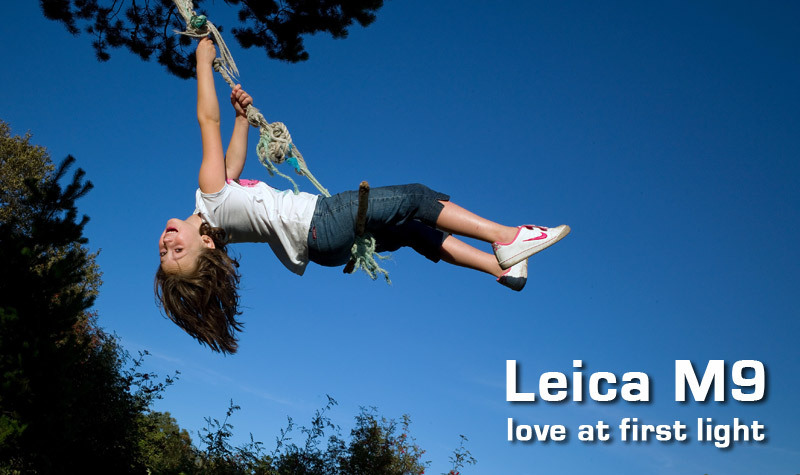 Leicas have never really appealed to me. Why should they? They're ridiculously expensive, and can't do anything that my Nikons can't do better (is that an angry Leica mob I'm hearing..?). Leica M9, Leica Elmarit-M 28mm f/2.8, 160 ISO, 1/3000 sec. (Needless to say, the original DNG files includes considerably more details than the downsized and slightly processed JPEGs seen here). Admittedly, I was intrigued when Leica announced their first digital rangefinder - the M8 - in 2006, but considering its price, 1,3x crop factor, embarrassing IR problems, lousy high ISO performance and other issues, I soon lost interest. Michael Kamber, a US photojournalist, tested the M8 under harsh real world conditions in Iraq, working for The New York Times. His conclusion: «I have found the Leica M8 to be unreliable, poorly designed, and to deliver substandard results in most of the situations in which I have used it. I can't think of any camera - or for that matter any electronic device I have recently used - that so thoroughly fails to live up to its potential and its heritage». Ashley Gilbertson, another photojournalist in Iraq, came to a different conclusion: «In my opinion, Leica has created a perfect transition to digital from its M-series film cameras. 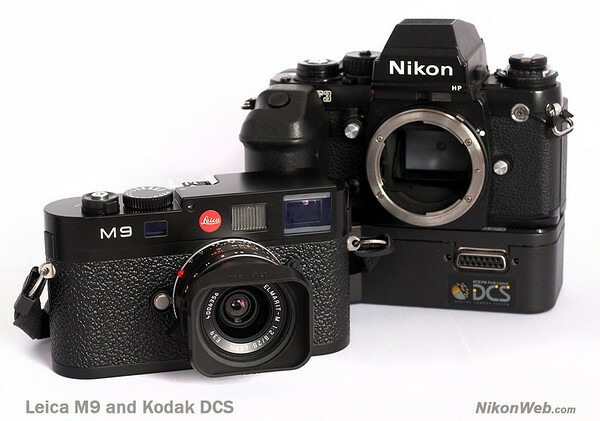 The Leica M8 is just as small, almost as durable, and as easy to use as its film predecessors, and it yields an incredible file in both size and sharpness.» There's a link to both articles at bottom of page. Many people were happy with their M8's - and some of the issues were fixed - but I think it's fair to say that the M8 never became the ultimate digital M camera Leica wanted it to be. Hence the M9. Leica M9, Leica Elmarit-M 28mm f/2.8, 800 ISO, 1/8 sec. Photographing with a classic rangefinder is completely different than shooting with a modern DSLR. Not necessarily better or worse (you have to decide for yourself) - but definitely different. Forget about autofocus, zoom-lenses, image stabilization, video and all the other fancy features found in your state of the art DSLR. Using a Leica M camera is taking a step back, both technically, mentally and financially. At the time of writing (September 2009), a Leica M9 will set you back $7000 - if you can get your hands on one. For comparison, Nikon's 12.1 megapixel D3 sells for $5000, while a 24.5 megapixel D3X will cost you $8000. Canon's top of the line 21.1 megapixel EOS-1Ds Mark III sells for $6100 (US prices, B&H Photo). And it doesn't stop there. You'll need a lens, too. The cheapest one, a 50mm f/2.5 Summarit-M, costs $1295 (compared to $135 for a f/1.8 50mm Nikkor lens). If you want more speed, Leica also offers a 50mm f/0.95 (!) Noctilux-M lens for a whopping $10.000. In other words, Leica isn't for everyone. As far as I can tell, the M9 is primarily a camera for «enthusiasts». According to Leica's annual report for FY 2008/2009, Asia is the most important individual market for Leica Camera AG (36.6 percent of total sales). 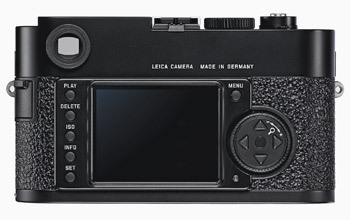 And who's buying Leicas in Asia, you think? Professional photographers? Not very likely. Instead, you'll find a new class of wealthy Chinese showing off their brand new European Leica cameras in the Forbidden City and Tiananmen Square. And then there's the Japanese collectors, of course. There's nothing wrong with any of this - it's just an observation. Realistically, the M9 isn't the best tool for most professional photographers (there are always exceptions), even if some die-hard fans will try to convince you otherwise. Sure, there are still some pro's using Leica M bodies - usually in addition to Nikon or Canon DSLRs - but they are few and far between. There's a reason for that. That being said: some people will claim that the M9 is simply an expensive toy, but let me assure you: it isn't. 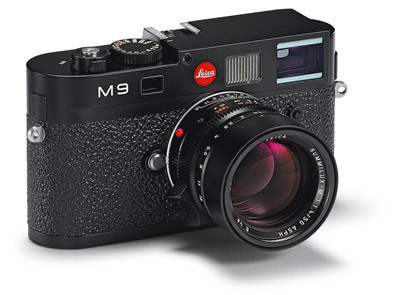 The M9 is a classic, no-nonsense rangefinder camera, that can be easily mistaken for a 50 year old model. Build quality is - as you'd expect - excellent. There's no grip on any of the M bodies, and the M9 is no exception. Unfortunately, the surface is kind of slippery, at least compared to the rubberized, almost sticky surfaces of my Nikon DSLRs. It's a small camera, so it's easy to hold and use. No problems there, but I often prefer to carry my cameras around by hand. I can easily carry a professional Nikon DSLR with a few fingers (it just sticks!) - but I find it practically impossible to do the same with the M9 (and not only because I'm afraid to drop it). A small grip and a rubberized surface would be nice. The command wheel on the back of the camera («central setting dial and direction buttons») is excellent - maybe even better than the multi selector on the Nikon DSLRs. Firm and very easy to operate. The camera menus and various function buttons on the left side of the monitor (Play, Info, ISO, etc.) are also very, very nice. Some of the best I've seen on any camera, even if it took a while before I figured out that I needed to press the «Set»-button to change white balance and image quality - I expected to find those settings by pressing the «Menu»-button. As usual I didn't start by reading the manual. I'm not sure how I feel about the need to remove the bottom cover to change memory cards (and to access the battery), but it works, and is much easier to do than I had expected. Shooting with the M9 is a lot of fun, and very easy once you get the hang of it (like I said, it's different from using a DSLR camera). The most difficult part is focusing - especially on moving subjects. The focus patch in the middle of the viewfinder is relatively small compared to the focusing screen in a DSLR (where you can use the entire screen). Also, the lenses are physically smaller than those you are used to. Other than focusing, there's a very small learning curve. If you're a skilled photographer, you'll be familiar with the M9 in no time. I took my first «real» M9 photo (intended for publication) some 15 minutes after I picked up the camera - and most of the time was spent moving from point A to point B. Battery capacity seems to be pretty good, but I haven't used the M9 long enough to know for sure. I had no problems shooting by day and charging by night (i.e. I didn't carry a spare battery). On several occasions, the main power switch (located around the shutter release button) came out of position, causing me to lose a few shots (i.e. the camera didn't fire). As others have mentioned, there should be a lock mechanism. Same thing with the central setting dial. When the camera is in A (aperture priority) mode, you can set exposure compensation by rotating the central setting dial. At one point, all my shots were overexposed because the dial had moved while carrying the camera over my shoulder. I realize that you can change this behaviour in the menu - see page 137 in the manual - but I thought I should mention it. Leica M9, Leica Elmarit-M 28mm f/2.8, 160 ISO, 1/4000 sec. I handed the M9 to a colleague, and the first thing he noticed was that it was difficult too see the entire viewfinder while wearing glasses. Good point - especially considering that many Leica users are probably at an age where they need spectacles (you just can't afford this stuff when you're 19 years old). Don't know if it's considered a real issue - I don't wear glasses (yet) and I've never really thought about it. Now that I've turned 40 I certainly will. I don't understand why Leica didn't put some more info in there. You can't even see the shutter speed when shooting manual (but you can when you switch to A - so the digits are already in there). There are three LED's in the viewfinder (two triangular and one circular) indicating the «correct» exposure, but there's no way knowing how far off you are. And why don't they use a plus and a minus sign (indicating over- and underexposure), instead of those meaningless arrows? Am I missing something? Personally, I'd love to see some analog needles, similar to the light meter in the old Nikon FE/FE2 bodies (and the FM3a). Doesn't get any better than that. The 2.5 inch LCD monitor is less than perfect. I guess it's ok, but nothing more. It's almost unusable for judging image sharpness, colors and exposure (except by checking the histogram). Zooming was so slow that I didn't bother to use it. I expect to see a much improved monitor on a future M10 model. 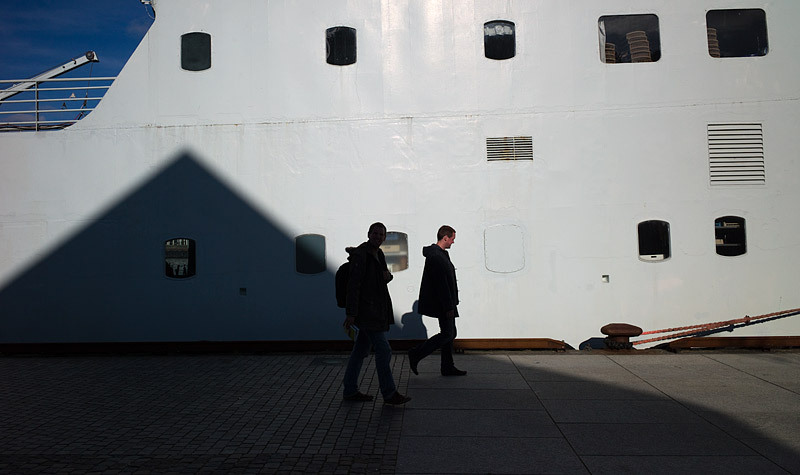 Leica M9, Leica Elmarit-M 28mm f/2.8, 160 ISO, 1/500 sec. 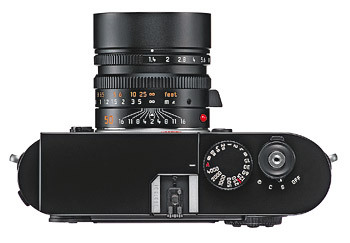 Leica's misson is «to deliver better images», and that's exactly what the M9 will do for you. With its 18 megapixel (5212x3472) Kodak sensor and super sharp Leica M lenses, image quality at lower ISO's is impressive - no matter which camera you're comparing with. In fact, since the M9 doesn't have an anti-aliasing (low pass) filter in front of the sensor, photos from the M9 are sharper than those from most other cameras (sharpness isn't everything - but it's usually a good start). There's a downside, of course. 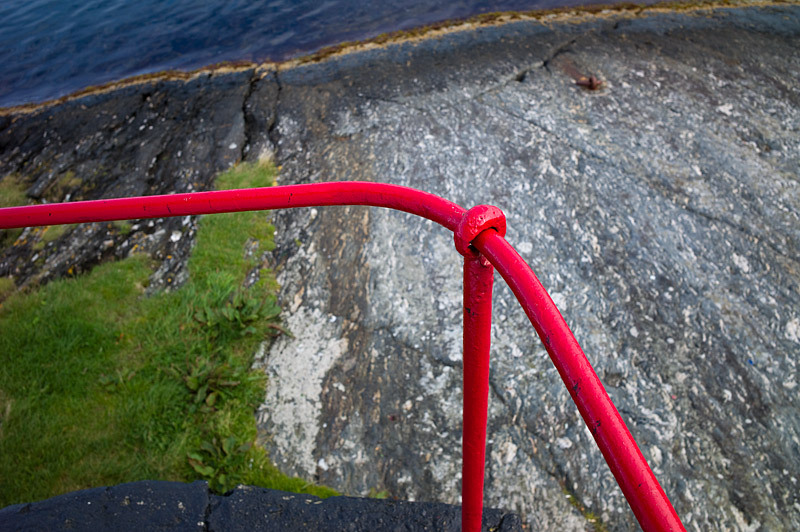 You risk seeing some moiré and other artifacts in photos with fine details. It's probably not a big issue for most people, but it's nice to know before spending $7000 on a new camera. You should also know that some programs will deal with these issues (i.e. aliasing/moiré) better than others. I got some nasty results processing a particular M9 DNG file using Adobe Camera Raw (ACR). Processing the file in Capture One Pro gave a much better result (considerably less artifacts and better sharpness) - but I prefer ACR's colors and overall «visual punch». The files processed by Capture One Pro seems a little dull - but they can probably be tweaked to resemble those processed in ACR (I guess I simply haven't spent enough time with Capture One yet). 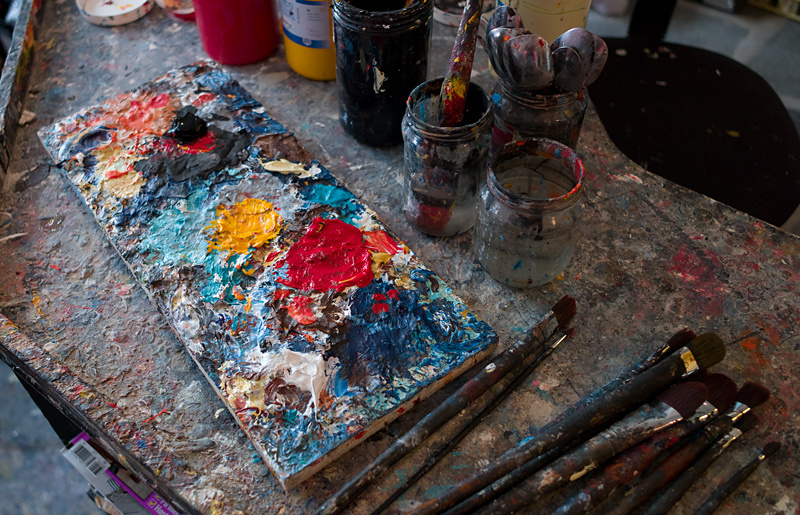 Leica M9, Leica Elmarit-M 28mm f/2.8, 160 ISO, 1/180 sec. M9 files are hard to beat, but only up to a point. Like its predecessor, the M9 is less impressive at high ISO's. 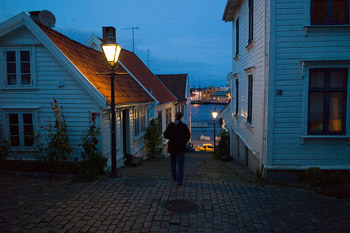 For newsprint, you can easily print and get away with a 1600 or even 2500 ISO shot. The same for web use. Downsize one of those hefty 5212x3472 pixel files to a 1000 pixels or so, and you'll effectively hide most, if not all, noise. No one will notice. Looking at 1600 ISO M9 photos on the monitor at large scale is a different story - I was surprised to see the amount of noise in my first 1000 ISO test shots. It's still useable, but it can't compete with high ISO shots from a top of the line Nikon or Canon body. There's a reason why the M9 is limited to 2500 ISO, while the D3 goes all the way up to 25600 (using «HI2 boost mode» - 6400 ISO by default). 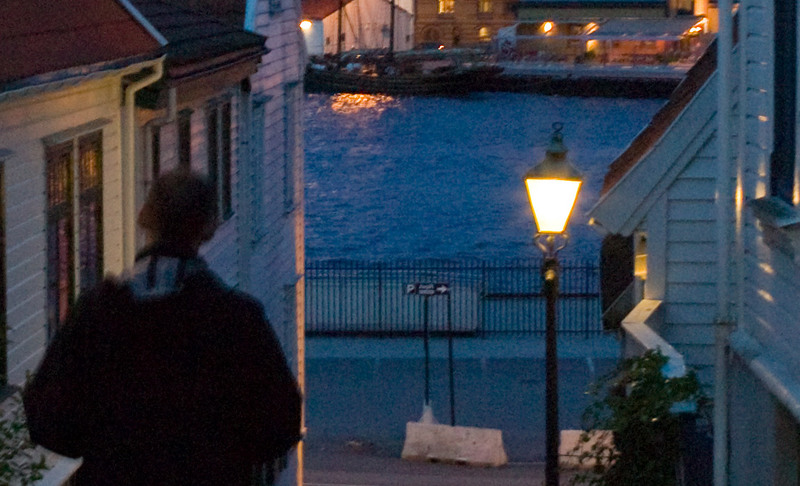 Click to see 100% crop from the above 800 ISO photo (225 KB 1151x699 pixel JPEG). This isn't a scientific test - so take it for what it's worth - but it's a «real world» example, taken under very dark conditions. Someone suggested that high ISO shots from a normal (or longer) lens would be better than those taken with a wide angle, due to in-camera vignetting correction. This makes sense, but I haven't been able to test it, as I only had a Leica 28mm f/2.8 Elmarit-M lens to play with. I'm sure we will know soon enough. I personally don't worry much about high ISO image noise. I grew up with grainy, push processed 400 ASA b/w and slide film - which was far worse than the 1600 ISO photos produced by most modern digital cameras, including the M9. I can't and won't draw a definite conclusion, but based on my own test photos I believe many users will be disappointed with ISO's above 800, or so. That doesn't mean it's «useless» or «bad». It's simply a matter of personal taste and preference. They may be sharp, but I'm pretty sure that most people won't accept the noise. At the end of the day, image sharpness and acceptable quality is a matter of personal taste, so it's a futile discussion. My own conclusion: There's a reason why Leica limited the M9 to 2500 ISO. 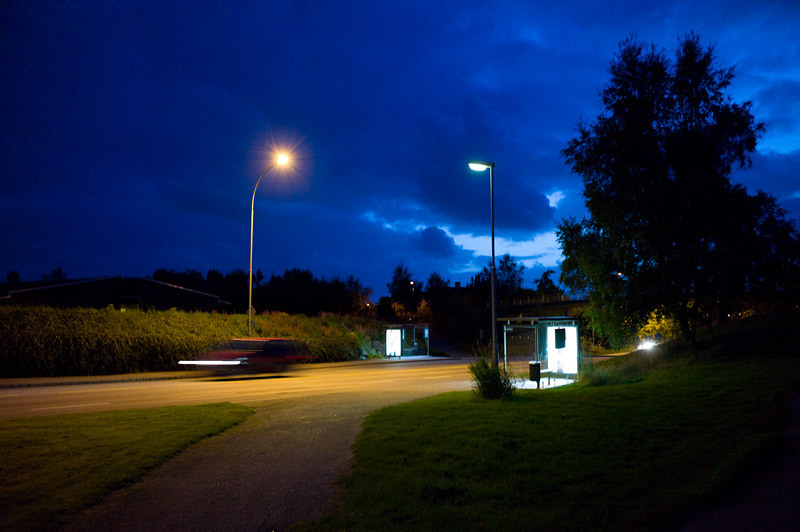 Leica M9, Leica Elmarit-M 28mm f/2.8, 400 ISO, 1/30 sec. M9 raw files are saved using Adobe's DNG (Digital Negative) format, which I guess is a good thing. My own professional Nikon cameras use Compact Flash cards, so I only had a few SD cards to use with my loaner M9. The uncompressed DNG files are 37.7 MB in size, meaning I was able to capture 55 photos on a 2GB SD card. You can double the effective space on your card by saving the raw images as compressed DNGs. I doubt you'll ever notice any difference, but for maximum quality it's probably best to keep the files uncompressed (according to Leica, compressed DNGs «causes only a negligible deterioration in quality»). For my test purposes, the Sandisk Extreme II cards I had available were more than fast enough. DNG files will open in many different programs, but like I've already mentioned, there may be situations where one program will perform better than another. The M9 will also capture JPEG images, but I see little point in purchasing a $7000 camera to shoot JPEGs. That being said, the well-lit, well exposed JPEG test photos I took came out just fine. During my days with the M9, I experienced a couple of odd glitches. It doesn't necessarily indicate a general problem, but I wanted to share these in case someone else experience similar issues. Glitch number 1: Testing a «no brand» memory card, the camera displayed a «No SD card» error. I was still able to capture photos, and could even see them on the LCD monitor. Trying to read the card (using an external card reader), it was completely empty. I have no idea why I could see the photos on the monitor earlier - maybe they were just being read from memory? Using the same card, I was able to replicate the «No SD card» error, and capture photos one more time. But this time I got a «Reading folder data - please wait» message when pressing the play button. This doesn't make much sense when the camera had already reported there's «No SD card». Then the camera froze, forcing me to remove the battery to make it work again. One could argue that it takes a stupid user to capture photos after seeing a «No SD card» error. Still, a $7000 camera should be able to handle such scenarios gracefully. This should be fixed. Leica - are you listening? Needless to say, I didn't bother testing this particular card again. Glitch number 2: Having transferred photos from a 2 GB Sandisk card to the PC, I later discovered that 24 of the files were unreadable. The file size is correct (same as the other M9 DNG files), but Adobe Photoshop won't open them: «Could not complete your request because it is not the right kind of document». I've shot a ridiculous number of digital photos since 1999, but I've never experienced anything like this. That being said - this happened on the first day with the M9, and I've had no problems since. Hopefully, it's not a camera issue at all. Despite its shortcomings, the M9 is a wonderful camera. It's not the «best» allround camera in the world (let's be honest), and common sense dictates that a DSLR - with all its bells and whistles - is a better buy. You'll get a lot more for less, purchasing a Nikon D700, a Canon EOS 5D Mark II or some other full frame DSLR. But Leica isn't about common sense. It's about feelings. 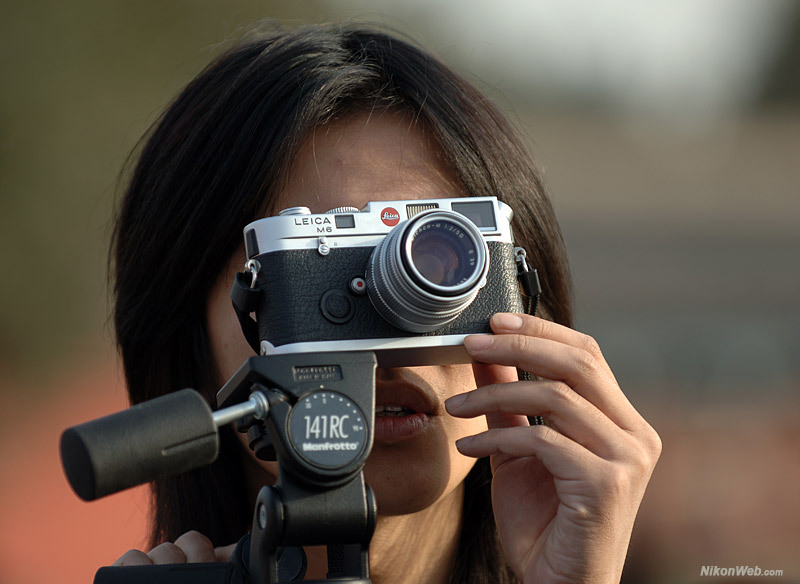 You purchase a Leica with your heart - not your mind. And let me warn you: It's very easy to fall in love with the Leica M9. For me, it was love at first sight!